The annual University of Redlands Relay for Life, one of hundreds of Relays across the country, was held at the Ted Runner Stadium last Saturday. 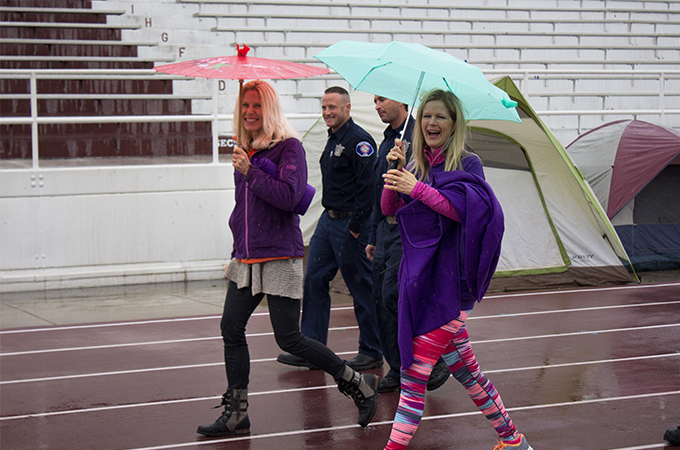 Dozens of Bulldogs and Redlands community members braved the rare California rain to walk and raise money for the American Cancer Society. The rain was already coming down when the event officially kicked off at 9 a.m. The University’s own Chemistry Professor Rebecca Lyons and Political Science Professor Renee Van Vechten were invited up to the stage to share their cancer survivor stories. At Saturday’s relay, members of the Redlands Fire Department demonstrated their support by leading cancer survivors and caretakers in the first lap around the track, while Relay participants cheered them on. The day continued with free food from local businesses, activities and games sponsored by the Relay committee, fundraisers hosted by U of R organizations stationed around the track, and an abundance of walking. 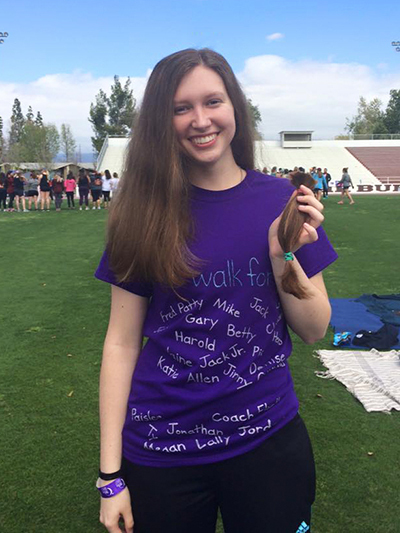 During the 2016 Relay for Life, Taylor Matousek ’18 shows 8 inches of her hair to be donated to Pantene Beautiful Lengths, which provides free real-hair wigs to cancer survivors. As for me, this was my fourth time participating in the Relay at the U of R. It’s an important event to me because 19 of my family members have been diagnosed with various types of cancer, and several have passed away. I walk for all of them every year, although I haven’t been able to beat my personal record of 20 miles set in my sophomore year. That same year, I donated 8 inches of my hair at Relay, which went to Pantene Beautiful Lengths, which provides real-hair wigs to cancer survivors, free of charge. What is normally a 24-hour-long event was, unfortunately, shortened to 12 hours due to the weather. Despite that snag, the U of R raised over $18,000 for cancer research. The first half of Relay usually concludes with the Luminaria ceremony in which paper bags decorated in memory or in honor of those who fought or are fighting cancer are placed around the track and lit with candles. Since the Luminaria ceremony couldn’t be performed, a separate ceremony will take place on a yet-to-be-determined date in a couple weeks. 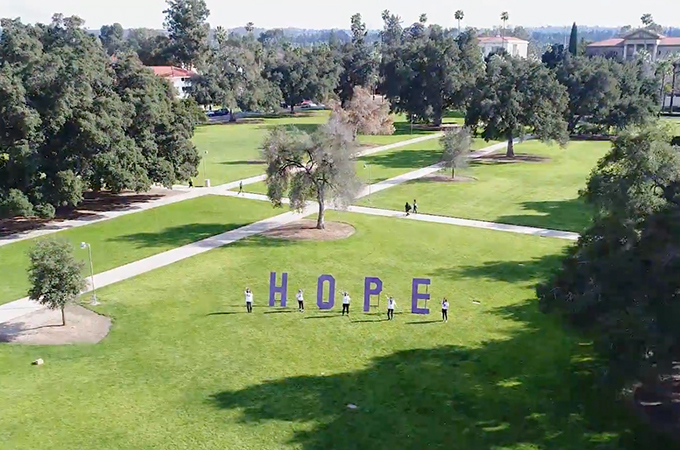 Watch this video made in preparation for the 2018 U of R Relay for Life, which includes President Ralph Kuncl speaking on his participation in the event after cancer diagnosis and treatment. If you are a current or entering student who would like to get involved in the U of R Relay For Life Committee or if you would like more information on the rescheduled Luminaria ceremony, email Matthews at rebecca_matthews@redlands.edu . If you are interested in student activities at the University of Redlands College of Arts and Sciences, see more information on student life.